Thank you to Social Skills Builder for providing me with their Social Skills Builder – Full app for review. As an OT we are often involved in self-regulation strategies which for some student involves working on social skills as well depending on those supporting the student. My School Day module targets ages 5-12 years with a focus on classroom behavior, peer interaction, rules and rituals and social emotions. Ten different video situations and questions are included in My School Day. Preschool Playtime module targets preschool and kindergarten ages with play skills, making friends, social emotions and appropriate behavior targeted social skills. Two modules, Playground and Preschool videos are provided with more anticipated in the future. 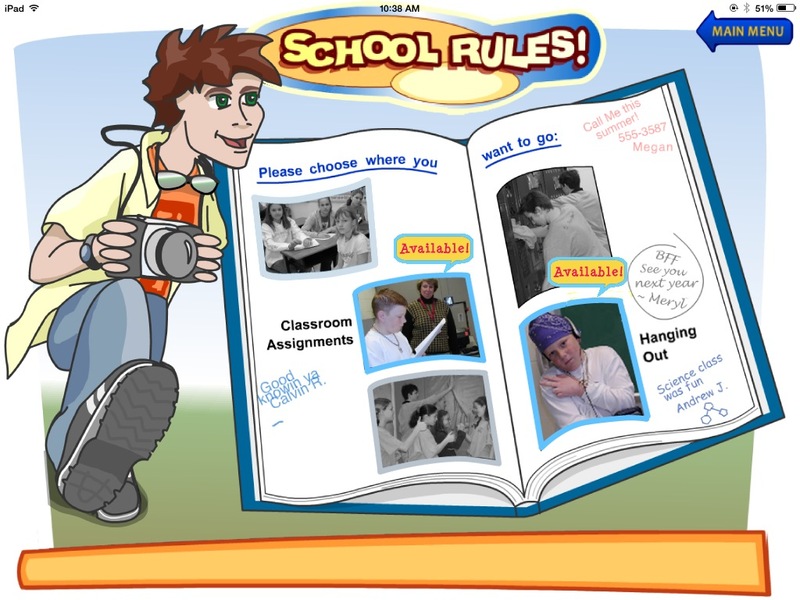 School Rules module is aimed at 8-18 year olds with content focused on peer interactions, language and behavior in classrooms, group work, PE class and locker room, personal hygiene and the hallway. My Community module provides learning social success within their everyday lives in the community. Modules include safety precautions, appreciating other’s emotions, peer interactions and language, and appropriate social behaviors and expectations. The videos in this module portray students interacting with games, a definite area of potential challenge for some students. Social Skill Builder Lite version (2.99) is available providing the four modules with the ability to purchase ala carte single modules for 1.99 as an in-app purchase. This allows those working with specific age groups the ability to purchase only preschool or elementary focused modules. Social Skill Builder app is easy to navigate with short real videos on social situations and comprehension questions suited to each targeted age range. Comprehension questions presented after each video provide positive animation and verbal feedback or redirection with each answer. Questions and answers are provided in text with answers read aloud when presented providing questions and answers accessible. In the Preschool Playtime, text is provided, although given the visual nature of students with social skills deficits, it would be helpful to have a visual image paired with the text and audio answers. As in all of the modules, School Rules and Community modules show age appropriate, real video scenarios that are potential challenges for student with social skill challenges. The positive reinforcements for older students could be adjusted to be more age appropriate they are the same animated feedback provided in modules for younger students. I did like the realistic videos presented and use of the language of expected / unexpected behavior that coincides with Michelle Garcia Winners Social Behavior Mapping (book) strategy. Social Behavior Mapping concept is a valuable and easy to apply social perspective taking strategy that can be used with all students and situations. Although I would like to see more modules in the different targeted age groups, Social Skill Builder provides immediate, out of the box social skills training activities that are easy for students to relate to. The addition of expected /unexpected concepts also provides a springboard of extension activities that could be used with this app and other personal social situations students may identify. Social Skill Builders Company also provides software and video subscription for preschool, elementary, middle and high school students. Thank you to Cheryl at Social Skill Builders for the promo codes! More for your teaching or OT mTool Kit. This entry was posted in App Reviews, Apps for Special Needs, Autism, iPad, iPhone, Social Skills, Special education, Video Modeling. Bookmark the permalink. Thanks Carol. I got one of the light apps. The full one was already taken.